The centennial of the Armenian Genocide last year brought forth a welcome avalanche of political activism, books, scholarly and journalistic reports, conferences, community projects, music, theatrical performances, visual arts presentations, and civic and religious commemorations. One such event was the multi-exhibition series “Kiss the Ground” (Yergurbakootyoon), which featured Perspectives from Exile—22 political cartoons by author, journalist, activist, and cartoonist Lucine Kasbarian of New Jersey and Massachusetts. Fourteen other Armenian-American creative people participated in the “Kiss the Ground” exhibition, which explored memory, loss and culture, and was held at the Cambridge School of Weston, Massachusetts. An offshoot of the exhibition is Kasbarian's Perspectives from Exile—a 110-page illustrated volume that includes a foreword by Curator Todd Bartel, a visual arts teacher and the director of the Cambridge School’s Thompson Gallery. The volume’s incisive political cartoons explore topics such as Armenian Genocide denial, reparations, Turkish and Azeri belligerence and NATO indifference to the Armenian Cause. 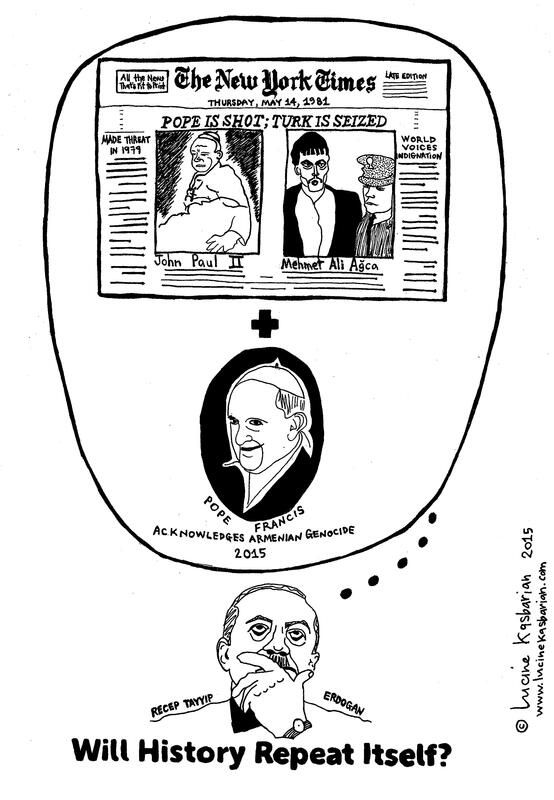 Just one of Kasbarian’s cartoons produced during the Genocide centennial year, titled “Threaten the Pope,” spotlighted Turkish President Erdogan dreaming about the fate of Pope Francis after Erdogan threatened the latter for acknowledging the Armenian Genocide. The cartoon depicts Erdogan recalling yesteryear’s attempt on the life of Pope John Paul II by Turkish citizen Mehmet Ali Agca. Also included in Perspectives from Exile are an interview with Kasbarian conducted by Bartel, photos of the exhibition, highly informative articles by Kasbarian about the history and consequences of the Genocide and its denial, and the artist's statement. Kasbarian's cartoons have appeared in more than twenty-five Armenian and non-Armenian publications and websites, including Foreign Policy Journal, Zartonk, Women's International Perspective, Massis Weekly, Veterans Today and Keghart.com. Kasbarian’s political cartoons reaffirm the validity of the opinion of many critics of “modern” Turkey that the rulers’ mindset has not changed from that of the Ottomans and the Young Turks. In a year which saw Turkey's continued oppression of its indigenous minorities and journalists; its shooting down of a Russian military jet; Ankara's continued denial of the Armenian Genocide; its president's support of ISIS and aggression into Syria and Iraq, not to mention his numerous inane pronouncements, Kasbarian's Perspectives from Exile provides some much-needed relief from the oppressive insanity and criminality pouring out of Ankara. This publication deserves wide distribution as it is undoubtedly a significant contribution to the published observances of the Centennial of the Armenian Genocide. or place an order with Armenian booksellers.